Rusty Rackets and Newbies kicks off on Saturday March 23, 2019 and runs non-stop throughout the season until November. The scheme is an inexpensive way try tennis at Westcliff Hard without committing to a full year’s membership straight away. 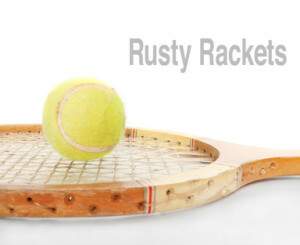 Rusty Rackets and Newbies is ideal for people thinking of taking up tennis for the first time or returning to the game. The Rusty Racket sessions take place on Saturdays from 6:00 – 7.30pm. You can come and go anywhere within this time period or stay for the whole duration. It’s up to you. All sorts! More experienced players do drill-based activities, singles, and doubles. Beginners and less experienced players receive basic coaching and are introduced to points and games as soon as possible. Whatever your level of play, you will be sure to meet players of a similar standard and strike up valuable playing friendships. During your trial period you are free to fix up games with others you meet from Rusty Rackets whenever you choose. It costs just £40 to sign up for six sessions. The only stipulation is that you must take up the six sessions within an eight-week time frame. During this trial period you are given full membership rights, allowing you to use the club and all its facilities as if you were a full playing member. Rusty Rackets and Newbies is aimed at people either taking up the game for the first time or returning to the game after time away. Standards within the group are mixed but you will nearly always find someone compatible to progress and play with. If you are thinking of coming along and giving tennis a go, then drop an email to [email protected] supplying your name and phone number. You will then be signed up and given a start date. What if I Decide to Join? If after completing the six sessions you feel you would like to join the club, then the £40 you initially paid to sign up for Rusty Rackets and Newbies will be deducted from your subscription fee. You also get a 50% discount off the full membership fee in your first year. And you can keep coming to Rusty Rackets for the rest of the season free of charge!